Cobra and Phases Group Play Voltage in the Milky Night Album reviews. Stereolab have always been in their own little world, seemingly more interested in capturing their shagadelic analog fantasies on record than connecting to their audience. And this time, the rather unwieldy album title may be enough to scare away the uninitiated. 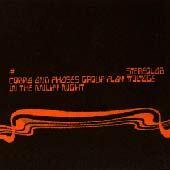 But actually, Cobra and Phases is probably Stereolab's most accessible disc to date. A complete lyric sheet is enclosed, many of the songs are actually in English, and there's no 18 minute 'epic' present. Maybe they've finally learned that people notice things like track length when CDs, not 8-tracks, are the medium of choice. But everything is relative of course - Stereolab are never going to be mistaken for Matchbox 20. And "Fuses," the bizarre, free-form Ornette Coleman-meets-XTC jam that opens the album drives home that point and dispels the notion that this group may ever be accused of 'selling out.' What's changed is that Stereolab have found that to be a little more concise isn't necessarily a bad thing. In fact, they could really write some excellent pure pop if they wanted to. They almost do, but it's always at least one eccentric twist away from normality; the twist could be an unconventional time signature such as the 7/4 rhythm of "Free Design." Or it could be a clumsy set of lyrics like "For the past 200 years the wine drunk and the freedom proclaimed are dubious and laughable." Or it could merely be the fact that a song that otherwise would be a Beach Boy-ish guilty pleasure ("Spiracles") or an instantly-relateable torch-angst anthem ("Velvet Water") happens to be in French. The standouts on "Cobra and Phases" are the "Infinity Girl," which boasts a beautiful, shimmering melody, "Puncture in the Radar Permutation," which kind of sounds like "Bennie and the Jets" if you have a wild imagination, and the ultra-catchy album-closer, "Come and Play in the Milky Night," which somehow manages to rock out like crazy without much of a guitar around, not an easy thing to do. And of course, no Stereolab disc would be complete without one journey so far into the unknown that the rest of the album sounds like� Matchbox 20 in comparison. This time, it's "Blue Milk," which not only is in French, but ventures off into a minimalist drone that achieves what Stereolab is probably out to achieve, the certainty that these five musicians must truly be from another planet. This is one of those groups you either love or hate, there's not much in between. I happen to love them, and this disc doesn't change that in the slightest, but 1996's Emperor Tomato Ketchup still stands as their crowning achievement. There's just a little too much syrup on this one, not enough grit. And enough with the French already.